Reduce Flour to 1 1/4 cups, and add 1/2 cup unsweetened cocoa powder. Makes 12. Preheat oven to 350 degrees. Butter and flour a standard 12-cup muffin pan, or use paper liners. In a medium bowl, whisk together flour, baking powder, and salt; set aside. With an electric mixer, beat butter and sugar until light and fluffy. Add eggs one at a time, beating well after each addition; add vanilla, and mix until combined. On low speed, beat in half the flour mixture, followed by milk; end with remaining flour mixture. Mix just until incorporated (do not overmix). Divide batter among prepared muffin cups, filling each 2/3 full. Bake until a toothpick inserted in center of a cupcake comes out clean, 22 to 24 minutes. Cool cupcakes in pan, 5 minutes; transfer to a wire rack to cool completely. Frost with your choice of buttercream. With an electric mixer, beat 8 tablespoons (1 stick) room-temperature unsalted butter until light and fluffy. On medium speed, beat in 1 1/2 cups confectioners' sugar, 1/2 cup at a time, beating well after each addition and scraping down bowl as necessary. Mix in 1/2 teaspoon pure vanilla extract. Increase speed to high, and beat until light and fluffy, about 5 minutes. Makes 1 1/2 cups. Make Vanilla Buttercream, then beat in 3 to 4 teaspoons seedless raspberry jam. Place 4 ounces bittersweet chocolate in a large heatproof bowl set over (not in) a saucepan of simmering water. Heat, stirring occasionally, until smooth, 2 to 3 minutes. Remove from heat, and cool to room temperature. Make Vanilla Buttercream, then beat in melted chocolate. What a beautiful presentation the two-tone batter makes. 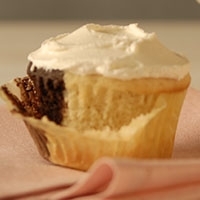 I am going to make them this weekend with a chocolate icing and may even add a bit of orange extract to the white batter - I love the orange/chocolate flavor meld. The knowledge your recipe is dense enough a batter to spoon in side by side is a super detail you shared. Lovely recipe. You've got my 5 all the way! Thank you for this great recipe. That's proffesional work...Thanks for sharing.